A strawberry truck farm was the original use of this land in 1915. The patent was signed in 1927 and eventually Clifford and Sharron Lobaugh purchased the property in 1976. It was Cliff’s longtime wish to donate a conservation easement to preserve the property in its current state. His wish came true in 2015. From the water, the property fits in well with the wilds of the Mansfield Peninsula of Admiralty Island. 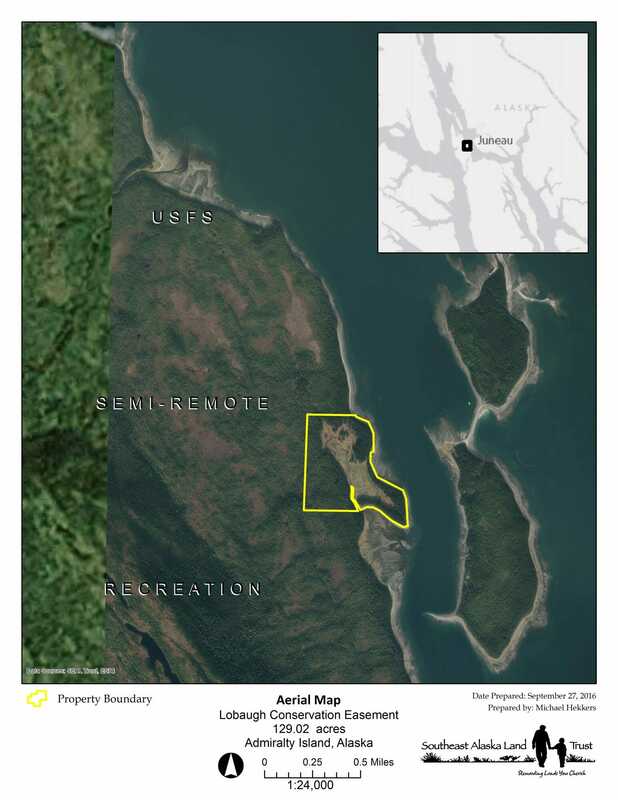 The property lies eight miles north of the Kootznoowoo Wilderness Area of Admiralty Island National Monument, and is surrounded on three sides by undeveloped Tongass National Forest. It’s the only private property and protected wetland estuary on the eastern side of the Mansfield Peninsula. 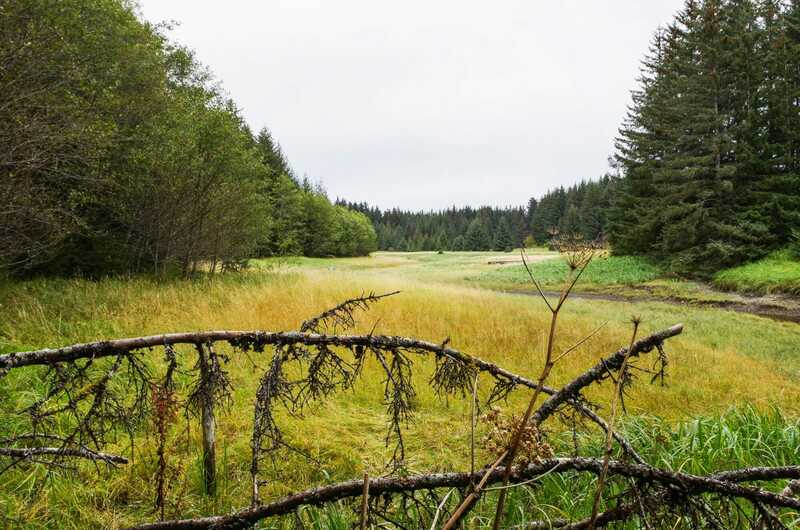 The mostly undeveloped nature of the property offers 75 acres of wetlands and 55 acres of forested uplands. The tidal wetlands and uplift meadow occupy 28% of the property and are heavily utilized as a stopover by migrating birds and waterfowl:Great Blue Heron, northern harriers, crows, short-eared owl, mallard, Greater Yellowlegs, Western Sandpipers, Wilson’s Snipe, Vancouver Canada geese, American pipits, Savannah sparrows, three different Sparrows, Ruby-crowned Kinglets, Orange-crowned Warblers, Hermit Thrushes, Hairy Woodpecker, Red-breasted Sapsucker, Golden-crowned Kinglet, Townsend’s Warbler, Chestnut-backed Chickadee, Red Crossbill, Brown Creeper, Common Loons and bald eagles and more. The forested peatlands occupy 30% of the property and contribute water and nutrients to estuary. Other frequently-seen wildlife include brown bear and Sitka black-tailed deer. Western toads have been found on the property as well as Meadow vole (Microtus pennsylvanicus) sign, a species endemic to Admiralty Island and few mainland sites.